CBTV deploys IP SNG flyaways - California. 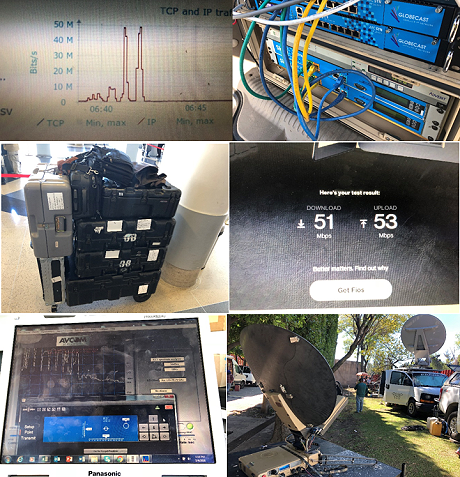 Santa Barbara, January 2019: California-based CBTV LLC has deployed a fleet of Ku band ‘Fly-away’ terminals dedicated to high bandwidth, high reliability IP services for internet connectivity, private corporate networks, streaming, and HD video transport. The systems allow for highly reliable, high performance and remarkably efficient digital transmission compared with legacy and competing systems. CBTV offers services without bandwidth throttling or caps, and offers service guarantees and data security far exceeding terrestrial offerings at existing locations. Based in California, kits are packaged to deploy regionally, nationally or internationally within hours, providing IP support for planned events, broadcasters, disaster recovery, and social media support. The kits/terminals are airline transportable in as few as three cases, can be setup in as little as 20 minutes and can be managed and operated remotely. Power can be provided by battery, portable generator or house power. A robust, end to end system utilizing military grade components and a custom service to solve specific client requirements and challenges worldwide with guaranteed quality of service. These are individually licensed satellite earth stations. Not to be confused with ‘I-Direct’ or any monthly consumer grade subscription service – this is ‘SCPC’ service on your own satellite bandwidth, on your own terms. Transport – Three to six cases, airline checkable as baggage. Antenna – 1.2m, segmented carbon fiber. Amplifier – Ku 50 Watt BUC, SSPA – modular system - contained in antenna feed arm. Power requirement – Worldwide 100 to 220V AC, 19 to 36V DC. Customized IP transport for internet and private networks (50 outbound Mb/s X 90 Mb/s inbound per terminal). Can be integrated with 3rd party modems, modulators, encoders, and a long list of ‘Bring Your Own‘ devices with handoff in IP, ASI, L-band or IF band. News / Media - traditional broadcast transmission, remote IP and phone communications, range extension and increased reliability for LiveU and similar IP transmission units. Special events – E-commerce, ticket validation, point of sale credit card transactions, remote office support, backstage support, cellular phone tower bypass/alternative. Disaster recovery communications and temporary connectivity - Government, first responders, corporate. We have spent years developing custom hardware and software to support field deployment of next generation IP services remotely. We also have trucks and crews.